The Samsung Galaxy S10 is perhaps the most heavily leaked phone around at the moment but one thing we haven’t heard until now is how big its battery will be. A new leak changes that though, as a photo of cases seemingly designed for the S10 range also includes text which seems to correspond to battery sizes. The image, shared by reputable Samsung leaker @UniverseIce, shows three different cases, one for a 6.4-inch phone (likely the Samsung Galaxy S10 Plus), one for a 6.1-inch handset (probably the standard Galaxy S10), and one for a 5.8-inch device (possibly the Samsung Galaxy S10 Lite). The S10 Plus case has 4,000 written on it, while the Galaxy S10 case says 3,500 and the Galaxy S10 Lite case reads 3,100. Those numbers could well be battery capacities, though without the ‘mAh’ on the end we can’t be certain. Assuming that battery sizes are accurate, it would mean the Samsung Galaxy S10 Plus has the same size battery as the Samsung Galaxy Note 9. That would make sense, since its screen is also rumored to be the same size. 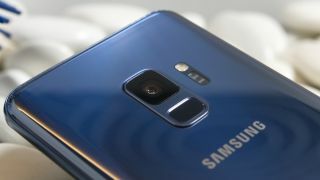 The standard Samsung Galaxy S10 meanwhile would have a battery the size of the one in the Samsung Galaxy S9 Plus, and the S10 Lite would have one marginally larger than the 3,000mAh one in the standard Samsung Galaxy S9. As for the design of the cases, they don’t really show us anything new, with the only real detail being the horizontal camera block, which we’ve seen images of before. Based on this image though it looks as though the two larger phones (likely the S10 and S10 Plus) could have the same number of lenses, while the smaller handset likely has fewer, given its smaller cut-out. We’ve heard plenty of camera rumors in the past, but there’s some disagreement as to how many lenses each model will have. Based on the size of the cut-out in this image it looks likely that the Galaxy S10 Lite has two lenses, while the larger phones possibly have three. We’d take all of this with a pinch of salt, since these cases could be designed for other phones or simply built based on inaccurate information, but in any case, we’d expect to hear plenty more about the Galaxy S10 range soon, as it’s likely to land at or around MWC 2019 in late February.